A 161-year-old company doesn’t top the Globe 100 without making some updates. Smith & Wesson Holding Corp. has expanded its product lines significantly since 2005, when it was still known almost exclusively for revolvers. But a key to the Springfield gun maker’s surge from an unranked Globe 100 company last year to number one this year was a matter of focus. 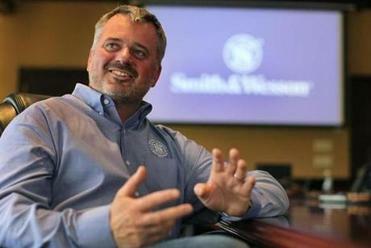 Just two years after Smith & Wesson bought a security company under a plan to diversify, chief executive James Debney — who had been the boss for all of 11 days — declared an about-face in the fall of 2011. With its sights trained on firearms once more, Smith & Wesson increased profits 14 times over in 2012, netting $66 million on sales of $538.6 million and rocketing to the first position on this year’s Globe 100 list. But the company’s renaissance is not merely a case of addition by subtraction. In recent years, Smith & Wesson has ventured beyond its core revolver business, introducing popular polymer handguns and modern sporting rifles. The latter — often referred to as assault rifles — represent Smith & Wesson’s fastest-growing product line. Sales increased by 85 percent last year, and a line that did not exist in 2010 delivered more than a fifth of the company’s total revenue. 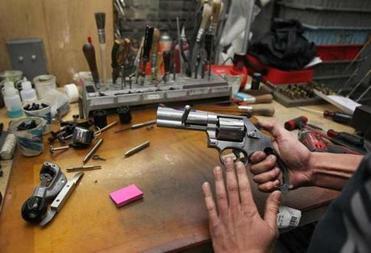 At the moment, civilian sales of polymer handguns outnumber law enforcement sales, 20 to 1. Smith & Wesson only launched a polymer handgun line in 2006, but the company now views it as the main driver of future growth. James Debney, CEO of Smith & Wesson. Smith & Wesson was the third leading American gun maker in 2011, the most recent year for which numbers were available from the Bureau of Alcohol, Tobacco, Firearms and Explosives. The company manufactured 896,255 firearms that year, trailing Sturm, Ruger & Co. and the Remington Arms Co.
Smith & Wesson’s ambition is tempered by a realization that, for all its smart moves, the recent spike in demand is due, in part, to external factors and will not last forever. First, an economic recession and a sluggish recovery buoyed the gun industry — even as others sank — on fears that high unemployment would increase violent crime. Then President Obama, viewed by some gun owners as a threat to the Second Amendment, won reelection. In December, Adam Lanza shot and killed 26 women and children at an elementary school in Newtown, Conn., prompting lawmakers to consider new firearms restrictions. As Americans clamor to buy certain guns while they know they can, Smith & Wesson has racked up $668 million in backlogged orders at last tally, an all-time high for the company. A Smith & Wesson revolver. Smith & Wesson has expanded, too, hiring 350 new workers at its Springfield manufacturing center in the last two years — already exceeding the 225 jobs it was required to add over a seven-year period, in exchange for $6 million in state tax breaks awarded in 2010. With 1,500 employees in Massachusetts and an $80 million Bay State payroll, “we’re a key part of the local economy, for sure,” Debney said.